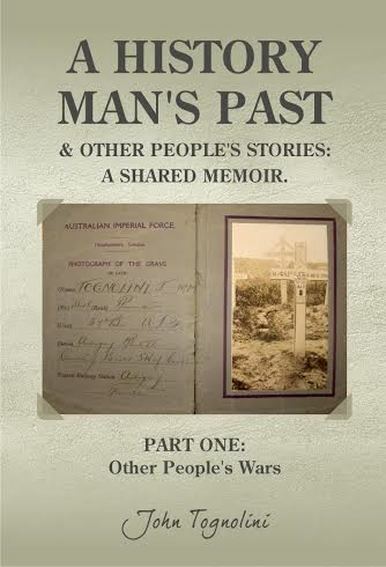 Derek Abbott* reviews A History Man’s Past & Other People’s Stories: A Shared Memoir. 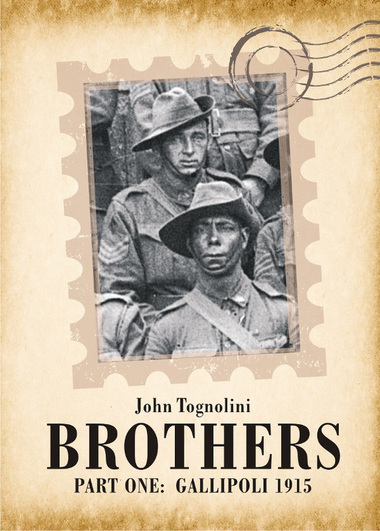 Part One: Other People’s Wars and Brothers, Part One: Gallipoli 1915, both by John Tognolini. A History Man’s Past is a difficult work to place. In an earlier time it might have been described as a ‘commonplace book’ – opinion pieces, transcripts of interviews, snippets of family history, quotations that have taken the author’s fancy – assembled ‘to highlight the Wars that Australia has been involved in, normally as a supporter of a great power … so they can be properly understood’. The book is not a history of those involvements. At best, it can be described as a commentary on some aspects of that history, relying heavily on the words of others – John Pilger and Noam Chomsky, Brian Day of the Vietnam Veterans’ Association and Stan Goff, a United States veteran and anti-war activist. Tognolini is resolutely of the view that we are misled by our leaders about the causes and nature of wars and the need for Australia to become involved in them, whether it be as part of the British Empire in 1914, inviting ourselves in – Vietnam and now Syria – or, with the aid of dodgy dossiers, Iraq in 2003. The real nature and conduct of these wars is hidden from the people because, if they knew the reality, they would withdraw support and be much more sceptical of future involvements. There is throughout the book a tone of truths being revealed and conspiracies unmasked when, in fact, most of what concerns the author (and the people he quotes so extensively) has been the subject of scrutiny and analysis for many, many years. There is also a lack of context. In 1914 Australia did not have an independent foreign policy and a declaration of war by Great Britain on behalf of the Empire necessarily included Australia and the other Dominions. In Korea, Vietnam and Iraq, Australia chose to become involved, having regard to international alliances and obligations and assessments of Australia’s national interest. Thus, whether one agrees with the decisions or not, these were not somebody else’s wars. The problem, all too often but particularly in Vietnam and Iraq, seems to be that, if one may misquote Clausewitz, war is the continuation of bad policy by other means. The author’s contributions to the book do ask some valid questions about Australia’s official attitude to the commemorations of its wars, for example, whether enough is done to acknowledge the participation of Indigenous soldiers, whether the Australian War Memorial should follow its Canadian counterpart and acknowledge the frontier wars through which this continent was seized from its Indigenous inhabitants, whether the amount being spent commemorating the centenary of World War I would be better spent on addressing the human costs of more recent wars and whether the new John Monash Centre at Villers-Bretonneux will be an ‘honest’ portrayal of the reality of war. Brothers adopts the ‘fiction style of a novel’ to describe the experience of the ordinary soldier on Gallipoli. To the author’s credit he wishes to present an honest picture of the ANZACs not the sanitized caricatures of the legend. I was reminded of Pilgrims Progress. Two Australians, a shearer and an English migrant schoolteacher of impeccable working class credentials, are seconded as scouts. They wander the battlefield meeting characters whose only role in the narrative is to represent a ’type’ or to enable the protagonists to dilate upon the iniquities of the class system, the monarchy, socialism and the futility of war. Thus we meet heroic and long-suffering ‘good’ soldiers, soldiers of a variety of ethnic backgrounds, racists who torment them, thugs who beat up prostitutes in Cairo and a crook running a two-up school using two-headed pennies. Real-life British and Australian officers are then introduced to challenge the stereotypes of incompetent, upper-class twit Brits and selfless Australians. Two British intelligence officers, Aubrey Herbert and Charles Villiers-Stuart, are competent and brave (and remarkably tolerant of colonial informality); Australian Jack Antill is just as careless of his men’s lives as the most gung ho Brit. Nor is war glorious or death sacrifice: soldiers die squalid deaths in often mismanaged battles. Corporal Thomas, the schoolteacher, is even offered a commission – temptation in the wilderness? – which he declines because, as he explains at length, he wants to stick with his mates and he knows that, given his background, he will never be accepted as an officer and gentleman. Unfortunately, the book is burdened by its didactic purpose. The characters are barely developed; most arrive on stage, say their lines, and are not heard from again. A more rigorous edit would have removed some of the excessive detail and implausible precision. At one stage we get a list of places where the soldiers are from – running to 17 towns presented as ordinary conversation – at another a torpedo is spotted 173 metres (not yards) from a troopship and on a number of occasions terms are used and then their meaning explained (‘white horses’, ‘shrapnel’). There are also a few inaccuracies: for example, the British royal family name was not ‘Battenberg’ but ‘Saxe-Coburg-Gotha’ and the name Windsor was adopted in 1917, not 1915. The Battenberg who changed the family name to Mountbatten was Prince Louis, First Sea Lord at the outbreak of the war. Scholarly and popular historical writing, certainly since Bill Gammage’s Broken Years (much of it acknowledged in the author’s bibliography), has done a very thorough job of presenting honest and rounded analyses of Australia’s military history. Neither of these books adds to our knowledge and understanding of that history nor will Brothers attract much of a readership as a work of literature. It is a risk when self-publishing that a work misses out on the dispassionate scrutiny of a professional editor or publisher. * Derek Abbott is a retired Senate officer with a history degree from Aberdeen University and a long-standing interest in military history. He has reviewed books for Honest History on World War I, Serbia’s Great War and popular resistance in World War II and the future of Asia.